I squealed with delight when I found this on the net. This is just sooooooo cute! Whoever you are that made this, you made me so happy. Thank you. And now, one brief question about TSC's second film appreciation gathering: Would we prefer to have it this Thursday night or Friday night? And as for the film to be screened, I'll bring a few, inshaallah, and we'll take a vote on the night, alright? Don't forget. Don't eat before coming, because food and drinks will probably be served. How do we feel about nasi lemak? 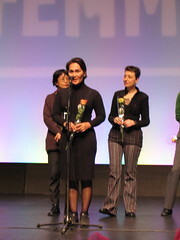 The Jury's citations were announced in French throughout the evening. Having hoped to win some small Audience Award, or Press Award, or some Special Mention, I saw all of those awards go to other films, one by one. I was not in the least bit surprised, mind. They were mighty films. There was one from a Salvadorean American director who already had an Oscar nomination in her bag. One from China whose film was chosen to open last year's Venice Film Festival. There was a Sundance Film Festival winner somewhere. And a string of seriously good films which had already won big in their respective countries. From Brazil, Denmark, Spain, the United Kingdom, Russia, and even a joint production between Turkey, Germany, Greece and France. And amongst all these giants, was little 'Sepet' - a film partly shredded by the censorship board at home, and often shat upon by a couple of angry Melayus on Kakiseni. "The theme for this year's festival is 'Differences'. There was passionate debate leading up to the final decision of this year's winner, because the ten beautiful films competing had such diverse contents. However, the panel unanimously fell in love with the sensibility that went into the making of 'Sepet' - the originality, the humour, and the wonderful interpretation of the actors - and the sensitive approach that was taken to deliver its message that Love could overcome all Differences. 'Sepet' from Malaisie has come a long way to be with us here. May it go even further to the rest of the world." I looked up questioningly to the head of the jury who was on stage. "Did she say 'Sepet'?" I muttered under my breath. The director of the festival, Jackie Buet, was furiously beckoning me to get up on stage. As soon as I had reached them, I shouted above the thunder of the applause, "What did I win?!" "You won le Grand Prix du Jury!" replied Jackie. "Is that a good prize?" I enquired, like the kampung Muar idiot that I was. "It is the first prize, you crazy woman! Bravo!" The rest, as they say, is sejarah. Alhamdulillah. Amidst all that jubilation, I saw my mum and my dad waving like crazy from the audience. Mum was crying I think. Gaining acclaim from both press and public as one of the best Malaysian features of recent years, Yasmin Ahmad's smart second feature Sepet (Chinese Eyes) is charming viewers wherever it plays. This intelligent and moving drama follows the blossoming relationship between a sixteen-year-old Muslim Malay girl, Orked, and Lee Seow-Loong, a Chinese Malaysian who sells pirate VCDs on a street market. Still at school, Orked studies the Koran, but also adores Hong Kong movie stars. Loong's life is more complicated. Without a father figure, he spends a lot of his time with a street gang: one which is involved - and rather out of its depth - with a rival gang. All this is in marked contrast to his home life with his adoring mother who gently mocks his trendy, spiky Hong Kong hairstyle. Ahmad builds these two figures into strong, interesting characters through the simple technique of reversing expected roles: Loong is the shy romantic who loves to read and write poetry, despite his father inappropriately having named him after kung-fu legend Bruce Lee; Orked is the argumentative free spirit with a passion for Wong Kar-Wai and John Woo. This provides for their meeting in a scene in which Orked goes searching for VCDs at the market, a scene which introduces most of the major themes of the film. It is here that Orked first expresses the film's underlying philosophy, observing after her first brief but meaningful meeting with Loong that "he doesn't know me well enough to like me, but he's in love with me." The film acknowledges that, while some people might insist that we moderate our actions according to notions of social acceptability, we are ruled by our natural instincts. You don't have to understand people to love them. You like who you like, and you shouldn't have to justify your feelings to anyone else. And it is not only people to whom this applies, but all forms of cultural interaction. Consumption of popular culture is a major factor here: aside from Orked's penchant for Chinese movies and Loong's love of Indian poetry, Orked's maid, Yam, has a taste for Siamese music, while her mother watches Chinese TV soap operas which she connects with despite not understanding anything that is being said. The issue of language also arises when Loong introduces Orked to his friend Keong and they try to establish which languages they have in common. 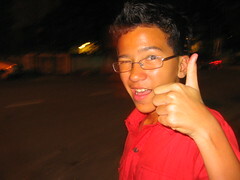 In fact, everybody speaks in the normal Malaysian way of slipping in and out of Malay, English and Chinese dialects. Nothing odd about that, you might think, but in fact Sepet has been praised for an unusually realistic approach to dialogue rather than the more stilted single-dialect dialogue often heard in Malaysian films. In these ways the theme of the acceptability (or not) of inter-ethnic relationships in Malaysia today is explored from several angles, though Ahmad is careful not to suggest any kind of social crisis arising from the subject. In fact, what appears to be the film's big issue turns out to not be much of an issue at all. Rather, the message of the film is that, when faced with the choice, most Malaysians value the happiness of their loved ones far above any petty ethnic concerns. As such, the film becomes as much of a romantic melodrama as a social drama, putting its characters through the emotional wringer and culminating in a tragic, tear-jerking ending. Much of the emotional drama arises from the parallel story of Loong's involvement in the low-level gang feud. Loong's former-girlfriend, Maggie, the sister of rival gang member Jimmy, finds out about Orked and spreads rumours that Loong has got her (Maggie) pregnant. The news drives Loong and Orked apart, and both must assess their priorities before she departs for university in England. As Orked, Sharifah Amani is a superbly feisty presence with a sharp tongue and a big heart. Opposite her, Ng Choo-Seong, a colleague of the director's, effectively bullied into the role of Loong despite having no experience and with no real passion for acting, is a touching romantic lead who underlines the film's most insightful conclusion: that although Asian parents often accuse their children of being corrupted by modernity, young men today actually offer much more love and respect to women than did the older generation. 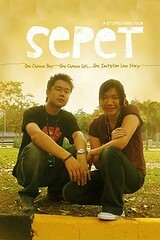 By global standards Sepet will be seen as a fairly uncontroversial film - level-headed, even-handed and kind-hearted. Nevertheless, Malaysia's strict censors still managed to find numerous scenes they deemed unacceptable for inclusion, leading the film to be released domestically with eight cuts. But, as optimistic and pragmatic as the characters in her film, Ahmad grudgingly accepts that this may be the price to be paid to allow her to make further films; and one has to concur with her point of view. Without a release for her largely self-financed film, Ahmad's career would be threatened by a crippling debt. This is unlikely to be a price worth paying; promoting the cut version of the film while loudly publicising the decision of the censorship board is surely a better strategy than withdrawing the film. Certainly it would be a great shame if Malaysians were prevented from seeing Sepet, and an even greater shame if this talented filmmaker denied herself the opportunity to make more films for the sake of an argument over petty censorship.